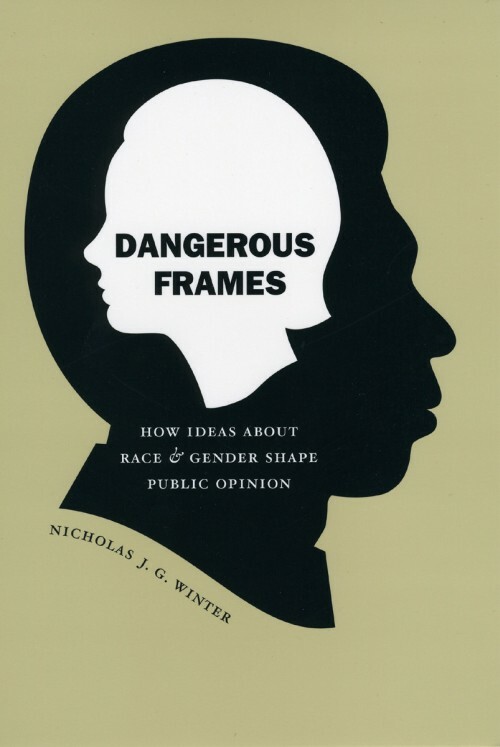 Nicholas J. G. Winter is publishing his book, Dangerous Frames: How Ideas about Race and Gender Shape Public Opinion at the perfect time, just as these issues are getting their most concrete expression in the political sphere. We asked him to reflect on the the Democratic presidential race in light of the ideas he explores in his book. The historic presence in the Democratic primary race of both the first woman and the first African American with serious shots at a major party nomination has understandably brought lots of media attention to the roles of gender and race in Americans’ political thinking and voting. Much of this coverage obscures rather than clarifies those roles. On the one hand, commentators ask whether black and female voters support “one of their own.” Do black voters support Obama? Do women support Clinton? On the other hand, others ask some version of the question “Are Americans more racist or more sexist?” Is gender more fundamental to American social structure, or is racism more centrally embedded in American politics. More concretely, will white male swing voters be more disinclined to vote for a woman or an African American man in the general election? Much of this coverage boils down to a single broader theme: the Democratic primaries as the “race vs. gender” election. This is deeply unfortunate, because it obscures rather than clarifies the roles of race and gender in American politics. It does so in (at least) two ways. First, it sets up race and gender as mutually-exclusive categories. This makes black women particularly invisible, or implicitly forces them to choose between their race and their gender identities. More subtly, it implies that only women have gender and that only non-whites have a race; this theme also reifies the American notion of race as a black/white dichotomy. Second, thinking about 2008 as the “race vs. gender” election hides the ways that candidates’ enactment of race and gender roles have always influenced elections. That is, it hides the more subtle but pervasive ways that citizens’ ideas about race and about gender shape their political choices. And indeed Barack Obama—the black man with the best shot at the job right now—began his campaign consciously pursuing a strategy of deemphasizing race. He worked, that is, to avoid being perceived as a stereotypical “black candidate,” to the point that Time asked in February 2007, “Is Obama Black Enough?” in an article about Obama’s then-ambivalent relationship with African American communities. Similarly in the realm of gender, throughout her post-White House political career, Clinton has consciously countered gender stereotypes in her emphasis on experience and leadership, her unwillingness to repudiate her support for the Iraq invasion, and more. Female politicians face a strategic choice to run with or against their gender, because voters’ gender stereotypes predispose them to see female candidates as less competent, less qualified as leaders, and less prepared to deal with issues like defense and the economy, but also as more honest, more compassionate and better on issues involving families and children. A female candidate, then, can capitalize on the “positive” gender stereotypes by running on honesty, compassion and “women’s” issues, or she can counter the negative ones by running on experience, leadership and “men’s” issues. Interestingly, in casting himself as a new and different type of leader, Obama does not draw on traditional imagery of the patriarchal, masculine leader. Martin Linsky argued last month in Newsweek that Obama is a “female presidential candidate.” In contrast to Clinton’s relatively authoritarian style, Linsky argues that Obama’s “commitment to inclusiveness in problem solving, deep optimism, modesty about knowing all the answers, the courage to deliver uncomfortable news, not taking on all the work alone, and a willingness to air dirty linen” represent a stereotypically feminine leadership approach. In some ways, then, this race has involved a literally female candidate who emphasizes a symbolically masculine style running against a literally male candidate who emphasizes a more symbolically feminine approach. The history of presidential campaigns suggests that even in the absence of female candidates, these symbolic aspects of gender matter quite a bit. Since at least Reagan, Republican candidates have painted themselves as “real men,” running against symbolically feminine (or at least less masculine) Democrats. They have accomplished this through a focus on both style (recall the unfortunate footage of Michael Dukakis in an armored personnel carrier and John Kerry wind-surfing and hunting) and substance (through suggestions that candidates from Carter through Kerry would be “soft” on foreign enemies and crime, for example). This is nothing new. The transformation of John Kerry from war hero to effeminate flip-flopper parallels President McKinley’s struggles to oppose the Spanish-American War in 1898. The former war hero’s hesitation to invade Cuba led to accusations that he lacked the “backbone” to stand up to the Spanish—a term whose phallic imagery was well understood by contemporaries. It is certainly possible in the current political context that Americans may find appealing Obama’s more consensual, less patriarchal approach. Nevertheless, we can understand the recent focus on Obama’s “toughness” in reaction to Clinton’s attacks as reflecting some concern about whether he is ultimately manly enough for the job first held by George Washington, the symbolic father of the country. For the moment the campaigns and many commentators are focusing on race and gender explicitly. It is worth remembering, however, that even when race and gender fade from the discussion, they both will continue to shape voters’ perceptions of the candidates and the issues in important and sometimes surprising ways.